After a 6am start we met Wozza for brekky and checked out of our hotel. 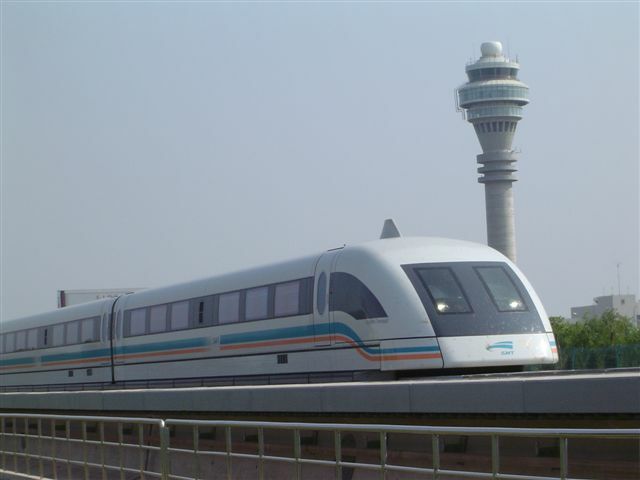 We took the taxi to the station and, hopefully, an experience to savour - riding on the MagLev at 430kph! My enthusiasm overcame my tiredness and we set out to the station. On the way we came within a few feet of a bad prang in the taxi. This car decided to change lanes without checking and the taxi driver slammed on the brakes. I sensed what was happening so I moved forward in my seat to steady the model helicopter bag that was in the front seat. As I did so the driver braked much harder and I slid out of my seat and up against the back of the seat in front, arms slung out in front of me towards the windscreen. We missed the other guy by only a few feet. A touch scary for Gail, but we’re here and in one piece so all is well. 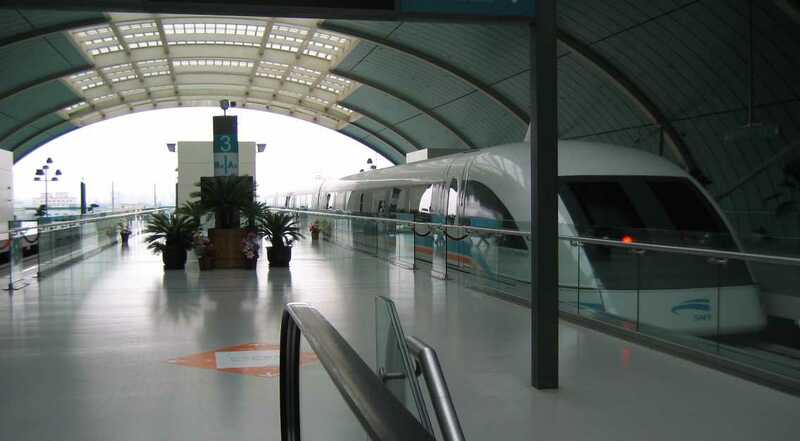 Now, onto the Maglev! Trains run every 15 minutes and cost Y50 per person. 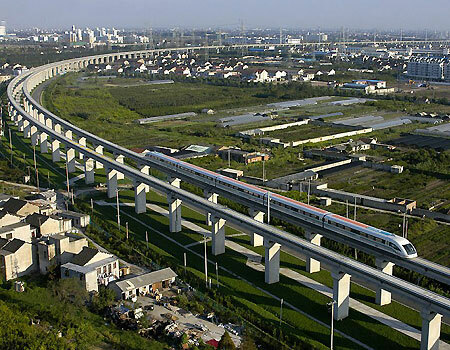 It only runs between the Longyang Lu subway station and the Pudong International airport. 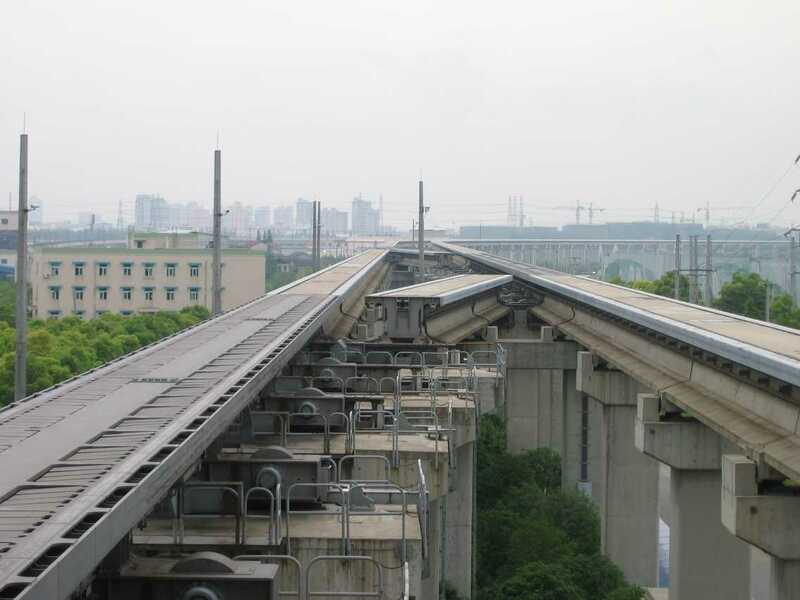 As testimony to its speed the ends of the Maglev are heavily splattered with bugs, like a car windscreen after driving in rural SA for a couple of hours. It’s a seriously impressive piece of kit. As you take off It starts with a low rumble and it just keeps on building speed right through to the 430kph top speed. The entire trip is over in just 8 minutes. It’s an amazing feat to be travelling this fast on something still connected (almost) to terra firma. It’s very quiet except for the wind noise as it rushes by. Speaking of rushing by, we’d just started to slow for the Airport and, not having seen the other train go in the opposite direction, I assumed that they were only running one train. Suddenly… THUMP! - WHOOOSH! The train travelling at a similar 400kph speed in the opposite direction whizzed by! Gail gasped as we felt the pressure wave thump through our train. I deliberately sat next to the window facing the other line so that I could experience it *snigger*. The closing speed is phenomenal and all you can see of the other train is a faint white streak on the other set of rails. We made it to the airport and were politely told at check-in that our tickets were invalid but a quick trip to the Shenzhen Airlines inquiries soon sorted that out. Because I did not have a lock on our case I was required to sign a waiver stating that Shenzhen Airlines were not liable for anything to do with our luggage. Seems that security is an issue here too. Shenzhen Airlines left China Eastern Airlines for dead as far as service goes. We travelled in a new Boeing 737-900 which was in excellent order, the pilot flew well with a very smooth landing, the food was very good (for airline food anyway) and the air crew were very professional. They even went through the safety drill in Chinese, English and sign-language to cater for any hearing-impared passengers. We were yet again required to produce our luggage ticket at the Airport. I was feeling a little picked-on at this point. Initially planning to take a taxi back to the city centre, we came across the 330 Airport Express bus for Shenzhen upon leaving the terminal. It looked like a good option so we took it for only Y20 each. Not knowing where it would stop (Chinese only) we were delighted when it conveniently stopped only 1 MTR stop away from our apartment. A little later and we were home. We’ve had a fantastic holiday in Shanghai and Wuxi, helped mostly due to Wozza’s familiarity with what to see, where to go and how to get around. Huge thanks to you, Wozza. I have no doubt that we’ll be back in Shanghai and Wuxi before our time here in China is over. no worries mate, hope to also see you in shenzhen some time in the near future. Twas great fun. Just so you know, the bike is now running in ship shape after I managed to get the pull start mechanism back together. It is now undergoing a paint job so that it resembles an awesome CBR600 that is getting around adelaide.